UPDATE: Vip is recovering from his CT scan, which revealed findings consistent with a severe sinus infection. We are working with a consultation team led by doctors from the University of Washington Department of Otolaryngology (ears, nose and throat) to plan for a near-future surgery to resolve this infection. We’re hoping for a positive outcome for Vip and are cautiously optimistic he’ll make a full recovery. Thanks for all the positive thoughts and well wishes—it means so much to us! Silverback Vip. Photo by Dennis Dow/Woodland Park Zoo. Woodland Park Zoo’s 35-year-old silverback gorilla, Vip, will undergo a diagnostic procedure for treatment of a chronic sinus infection. Vip’s upcoming procedure is provided by in-kind support from the local medical community, under the direction of Collins and the zoo’s animal health team. 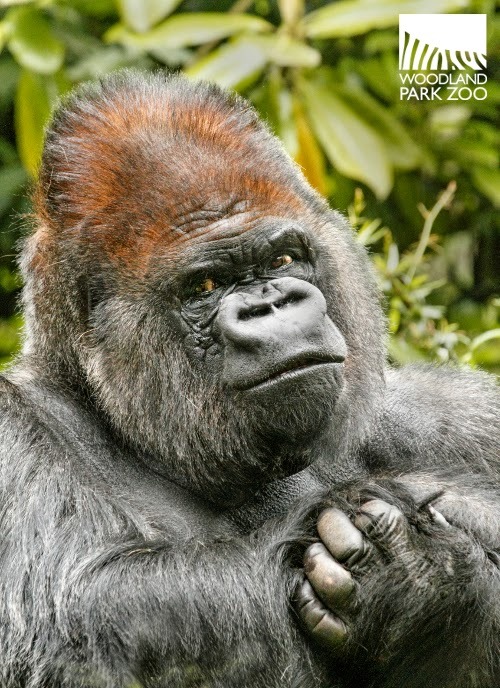 Vip, named for being a Very Important Primate, is one of Woodland Park Zoo’s adult male western lowland gorillas. Visitors and keepers know silverback Vip as the bedrock of his gorilla group, acting as both a leader and peacekeeper. He shares the zoo’s East exhibit with four females including daughters Calaya and Uzumma, and adult mates Amanda and Jumoke. Since arriving at the zoo in 1996, Vip has sired six daughters and continues to be a supporting figure for his group. Woodland Park Zoo supports conservation efforts for the critically endangered species through the Mbeli Bai Study, one of the zoo’s Partners for Wildlife. The study researches the social organization and behaviors of more than 400 lowland gorillas living in the southwest of Nouabale-Ndoki National Park, Republic of Congo. The data collected enables scientists to assess the vulnerability of populations to habitat threats and predict their ability to recover from decline. Best wishes. 35 is not that old for captive gorillas and we still need this great dad to be around with us.